Heathrow's homeless have blended in amid its masses of stranded flyers. It is a familiar scene: 3 a.m. at Heathrow Airport, and a gathering of people are sprawled across plastic benches in various poses of contortion. To be in transit is to be disconnected, but for some of those sleeping here, rootlessness is not temporary. Each night, scores of London's homeless men and women take advantage of modern travel delays by posing as stranded passengers in order to sleep in a warm and safe place. They play a cat-and-mouse game with police, often donning floral shirts, fanny packs and other travel accessories to blend in. And their increasing creativity  and ability to disappear in Heathrow's swelling crowds of delayed passengers  has prompted the airport to try a new approach. Last month, Heathrow commissioned a local homeless outreach organization, Broadway, to visit the airport once a week and survey its homeless population, while also trying try to coax them into temporary accommodation. They were not prepared for the scale of the problem they discovered: In the first four weeks alone, they conducted 100 interviews with homeless "passengers"  although some of those were repeat interviews, the number was far higher than anyone had expected. When TIME joined the outreach worker and police officers this week, the homeless people contacted included a man sleeping under his coat, another conspicuously hiding behind an open newspaper, and a woman clutching a duty free bag who insisted she was waiting for a flight, only to whisper when police were out of earshot: "I can't afford electricity; it's warm here; please, let me stay." These men and women may seem to embody the English tradition of the plucky Dickensian Dodger, but it would be wrong to mistake their ingenuity for anything other than desperation, social workers say. Like those to whom the travel ads all around the airport appeal, Heathrow's homeless are also in search of escape: from debts, legal problems, family responsibilities. They often have mental health or substance abuse problems, and they often refuse help. During the day, some travel by public transport into London to beg, busk or take drugs, while others remain in the airport, sometimes scrounging food off sympathetic restaurant and cafe workers. "When I came from Africa, I couldn't believe people could be homeless in Britain," says Broadway's Nigerian-born outreach worker Jeff Motunde. "But I discovered that homelessness is a way of life. It can be very difficult to convince people to receive help." Ingenuity is a necessity for Heathrow's homeless to avoid detection by police. "I thought about disguising myself as a passenger, but I have a bit of what you might call 'a luggage issue,' 65-year-old Joseph explains from a bench in the airport's remote bus terminal, pointing at a shopping trolley of bulging plastic bags. "They are hardly Louis Vuitton." "Rough sleepers," as homeless people are known in Britain, disguise themselves at all major airports, says Sandie Cox of Heathrow Travel Care, the social care organization overseeing the one-year pilot scheme. Indeed, Chicago's O'Hare airport instituted a homeless outreach in the 1990s. 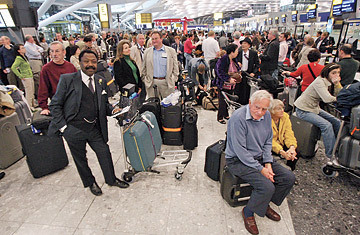 But while the problem may not be unique to Heathrow, several factors make it easier for rough sleepers to blend in. It is the busiest airport in Europe, has more delays than other major hubs, and while it doesn't serve Europe's low-cost carriers, it has still seen the effects of the democratization of air travel: gone are the days when you could identify a British air passenger by their suit and shiny shoes. Indeed, on Wednesday, the two scruffy passengers curled in the corner of a remote bathroom turned out to be holding tickets to LAX; they had chosen their spot because it was the only place they could find an outlet to charge their hand-held video game console. Of the half-dozen homeless who agreed to follow up with social care on Wednesday, it is possible that none will check into Broadway's temporary accommodation, Motunde says. Many of Heathrow's homeless will likely stay at the airport until they are arrested, or become ill. Until then, they will drift for nights on end in an otherworldly limbo of gleaming corridors, somnambulant passengers, and nonsensical advertisements for a life beyond their reach: The Linde Group: Those who split the air reshape the world. Solger Vitamins: Next Stop, Good Health!